Off we went to burn some calories before all the Easter chocolate on this absolutely glorious, warm and sunny Easter Saturday. I heard some had their hot cross buns before they started, yum! parkrun#208 saw 397 runners and 38 volunteers. Thank-you for the much needed lovely high 5s from our volunteers. Bunny ears were spotted and our sunny park run saw some tourists from as far away as South Africa and closer to home Lancashire. A PB for Adam Barber crossing the finish line first,well done. 76 runners got PBs. Reaching their 100th parkruns were Matthew Taylor, Daniel Taylor and Lee Whitehill. Sarah Conway doing brilliantly brought parkrun 208 to a close with the tail walkers Patricia Morris and Anne knights and we had 51 first timers. Market Harborough parkrun turns 4 years old!!!!!! So exciting and thrilling that we get to be a part of that special day. Bring cake, the more home-made the better. Life has changed for the better for me in a year. When they say running can change your life it certainly can. Barring injury i wont stop running. In May I'll be celebrating my 50th parkrun. I first ran when i was a teenager after leaving school and loved it but after getting married hubby and i dipped into it over the years not really taking it seriously. So April 2018 i took the plunge and decided to give it a go AGAIN, with friends encouragement. It led to making new friends from parkrun, entering races, becoming part of the parkrun community and i can run 10 miles almost comfortably. I've volunteered and rather than watching from the sidelines hubby's volunteered. He's volunteered 35 times. Even the dog's volunteered,she's a good tail walker.Brings her own tail. I didn't start parkrun until June 2018. I always wanted to do it but wasn't confident enough until my lovely friend Julie Swinn encouraged me. I haven't looked back,wish i'd done it earlier. There's nothing stopping you from encouraging your friends and maybe family members to give it a go. Who needs a lie in on a Saturday anyway! Paul Sinton Hewitt, the founder of parkrun had only 13 amateur runners for his very first parkrun. Who knew 15 years later there would be over 1 million runners and over 500 parkruns who come together every Saturday morning. Paul built us a playground so that anyone could come and take part, all ages, all abilities with no terms and conditions and even better for FREE! The Queen made him a CBE in her 2014 birthday honours list for his ‘services to grass roots sports participation’. Well deserved. No one need feel excluded and you'll never be last. Spare a thought for the back markers and give them a cheer and plenty of room to finish, after all it's their run too. Help your friend(s) over the line but remember not to cross it twice! We're so lucky to have a parkrun at Welland Park where we can run or walk each Saturday morning all managed by our excellent group of volunteers. Thank-you run directors who set up and keep us in order each week. Thank-you Michael Brown,this weeks run director. I love how friendships flourish at park run, people encourage you, it leads to other things such as signing up for races, cycling events, swim events. You get stronger, your time improves, you might have a goal in mind, you might even lose some weight and you become more confident. People come out of their shells and are happy to try new things like volunteering at parkrun. It's easy to help out for a hour then enjoy a coffee in the cafe afterwards. Where would we be without a bit of cake or a bacon sarnie at the cafe after a good run or to get a coffee before you volunteer on a cold day. Meeting up with friends discussing stats, races, injuries or just being happy you got round. We've got it all at Welland Park. A superb cafe, a place for our dogs to run round, a play area for children as well as Sundays junior parkrun. Please remember we do have to share the park with those who don't participate in parkrun so give them plenty of room. I know myself i've been in the zone and nearly crashed into one particular lady with her shopping trolley! I just love how parkrun has a great community spirit. I see so many smiling faces before and after. A few nervous ones too who soon relax and enjoy themselves. I hear stories of people saying why didn't they do it sooner like me and records broken each week when they get a PB. Plus lots of sweaty runners glistening in the sunshine and it's not even summer! If you have something to say then why not be a parkrun report writer and tell us your story. A very Happy Easter everyone.I'm off to volunteer at Desboroughs junior parkrun. Good luck to all those from our parkrun heading to London to run the London Marathon on the 28th April. Next weekend come celebrate Market Harborough parkruns 4th birthday, can't wait to be part of the next 4 years. Oh and bring CAKE! This morning started like any other Saturday, sorry, parkrunday… I got up, had a slice of toast and a cuppa, before heading off to the lovely Welland Park. 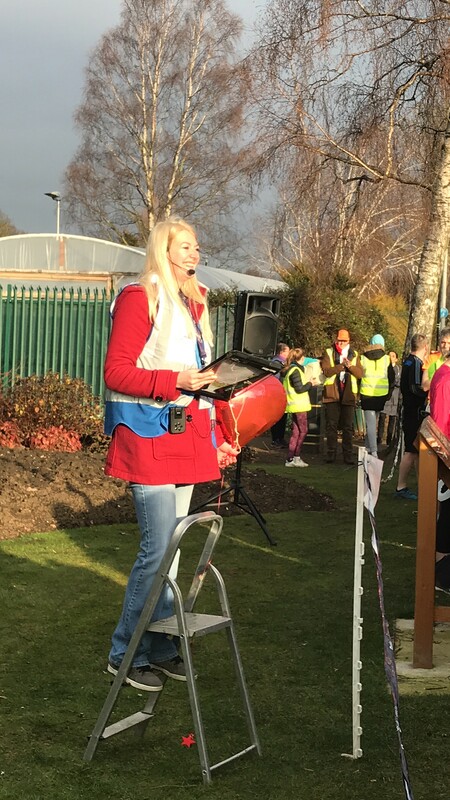 I chatted to a few friends before heading to the start line, where the RD – Lisa – announced this week’s milestones – Katherine Horder, Joanne Colbert and Aisha Redhead all completed their 50th parkrun - congratulations to you all, but especially to Aisha who is only 11 years old – well done. 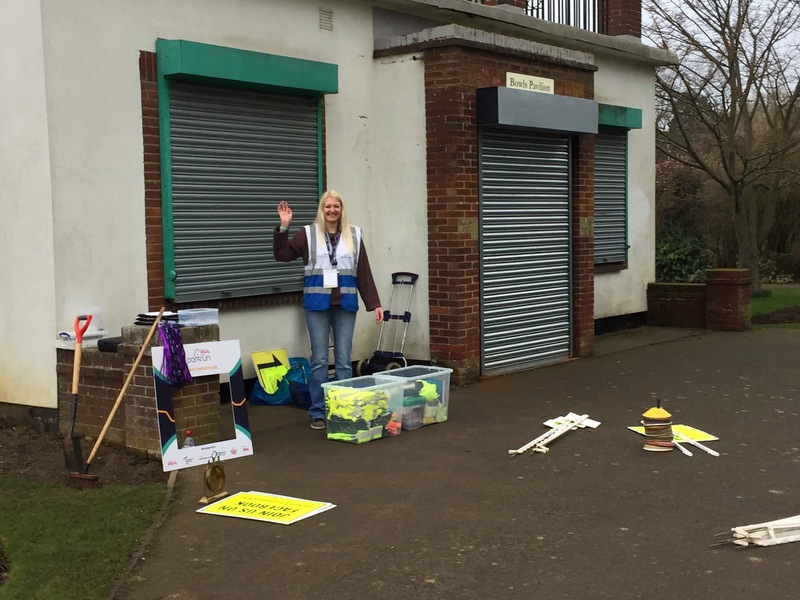 There was another unofficial milestone achieved today by our lovely marshal, Austin Hobbs – his 150th volunteer today – a remarkable achievement given that we have only had 204 events in Market Harborough. There was a huge round of applause for Austin as everyone showed their appreciation to him, and I’m sure he was even more generous with his high-fives on his corner this week. for a fantastic sprint finish as we crossed the line together, both achieving our best times in months (not personal bests, but it still felt like a massive achievement) – thank you Anne Linsell for spurring me on to the end. Let’s do it again next week! I set off to the café to catch up with friends, and not having to rush off was a rare treat this week – so much so that I finally left the park at 11.30am. We sat chatting, putting the world to rights, when RD Lisa approached our table and asked if anyone would like to write the run report this week. A sea of silence ensued, so I volunteered, and here I am! The beauty of parkrun is the social aspect of it. There I was, sitting in the café with friends, none of whom I knew until parkrun came to Harborough almost four years ago. Long after the majority of parkrunners have gone home, the RD and other members of the core team are still on duty, processing results that we all eagerly await the arrival of, trying to sort out any discrepancies between times and tokens. We should all be extremely grateful to the RD each week and the core team, because as corny as it sounds, parkrun wouldn’t happen without them, or the other volunteers, so a massive thank you from me. When most of us have dispersed home and are looking forward to next Saturday, the core team are still busy working behind the scenes, answering emails, replying to Facebook posts, sorting out the volunteer roster for next week, washing kit, sorting kit – the list goes on and on. This week saw 365 people run, jog or walk the course; there were 34 first timers, 10 of whom were completely new to parkrun – welcome to our wonderful family, we hope to see you again soon; there were an amazing 90 PBs today – brilliant running! It was an absolute pleasure being RD at the Market Harborough parkrun #203; it was also my last time as an RD, which brought about a number of mixed emotions. This is a brief history of my parkrun journey and what parkrun means to me. Graham and I were given a kick up the backside from our sister-in-law (a keen runner and PE teacher) at Christmas time, back at the tail end of 2014. After finding every excuse possible, we decided that we probably should do some exercise; eat a bit more healthily and drink a little less wine! We started to run/walk to the next village, which was extremely challenging for us both. We then decided to invest in a couple of mountain bikes and then saw an advert in the Harborough Mail about a Sprint Triathlon (whatever that was) and thought we should set ourselves a goal. We signed up for the event, and started to take regular trips to Corby pool; neither of us were great at front crawl. During this time, we met a very keen and enthusiastic gentlemen called Brian Corcoran, and as well as persuading us to join the local triathlon club, we also got to learn about a new parkrun that he was setting up in Welland Park. We both went along to his ‘test sessions’ and also made it to the very first parkrun. This was new and exciting, and the first time we had heard of this amazing phenomena that draws communities together and forges friendships and engages people to get mobile. Very quickly I became a regular volunteer; I have always had more pleasure from volunteering than actually running at a parkrun. I still get butterflies! I was invited along to join the core team in the spring of 2016 and have thoroughly enjoyed my three years as an RD. It is amazing how parkrun brings people together; people who you may not have had the opportunity to meet in your normal ‘day life’. It is a ‘happy’ place, with lots of positivity and friendliness and so many smiles. It almost seems incidental that you run 5km, as it is so much more than that! I wish you all well with your running, in whatever form that may take. We should all set ourselves goals and challenges, and I think they should all scare us a bit too! The thought of failure is a great thing to drive you on and push yourself. The sense of achievement is far greater when we come out of our comfort zone. We are all capable of so much more than our minds think we are, so what’s your next challenge going to be? Go on, push yourself as you really can do it! Earlier this year Flickr changed their settings, restricting the number of photos that free accounts can hold. It’s safe to say that the MH parkrun Flickr photos group holds way more than the limit Flickr have imposed! Therefore parkrun HQ have moved all event teams onto Google Photos. This is a little different in that we are now storing all photos for a particular event in its own Google Photos album and then each time we have photos we can share the link to the new album so parkrunners can browse through and download any photos they wish. The procedure is a little different for photographers also as someone from the Core Team (usually that week’s RD) will need to set up a new album and share the link with you so you can add the photos directly into the Google Photos album and then we will share the link for everyone. For the time being, Flickr is still holding all the MH parkrun photos and any photographers with a ‘Pro’ account may be able to add their photos onto Flickr, but we are aware that Flickr may close down or remove all the existing photos at any time. What about all those old photos I hear you ask?! Well good news, we have downloaded every photo from Flickr and set up Google Photo albums for all the events where photos were previously uploaded. How do I access these? Well below are all the links that you will need to any of the events up until event #201. The photos from the most recent events have yet to be added, but should be there very soon. We hope you continue to enjoy the lovely photos taken by our parkrun volunteer photographers and if you need any of them to be taken down, you can just contact us at the marketharborough@parkrun.com email address, then we will happily remove any offending photos. It’s 06:25 and I wake up. My alarm, set for 06:30, hasn’t gone off yet. It takes me a few seconds to work out what day it is. Ah yes, Saturday... parkrun day! Then I remember... today is my first day as Run Director for Market Harborough parkrun. The nerves kick in. As I get ready, I mentally run through what I have to do, what I have to remember, what to say in the pre-run briefing etc. I feel sick. I feel dizzy. I don’t like this feeling! Simon helps me carry the two boxes of kit and the speaker downstairs, and load them into my car. The kit is all ready to go. Laptop, radios and barcode scanners are charged. 38 volunteer bibs are washed, dried and folded, paperwork for volunteers is attached to clipboards and a final check ensures the tokens are in order. Turns out being RD is a week-long role! We leave home at 07:30, and arrive around 5 minutes later. The park is empty. I send Simon to the river to shovel the mud that has built up on the path out of the way, ensuring it’s not slippery for the runners. I can’t be dealing with a runner in the river on my first day as RD! Meanwhile I lay out all of the signs, posts etc. As volunteers and other members of the Core Team arrive I delegate sections of the course for them to set up. All is going to plan. It’s around 08:30 when most volunteers start to arrive. I tick them off on my list and hand them their relevant equipment and tell the marshals where I’d like them to marshal. It’s 08:50 now and that means it’s time to head to the start. Simon’s gone on ahead to get the speaker from my car and set it up. Mark approaches me and tells me that it’s his wife, Alex’s 50th run. I make a note and head to the start. Roger climbs the stepladder first and introduces me. I am only half paying attention, half concentrating on taking deep breaths and telling myself that I just need to follow the script in my hand. People clap and Roger steps down. My hands start shaking. I climb up the stepladder, realising it’s much harder to stand on than I thought. I don’t make it to the top step as I’m worried I’ll fall; luckily I’m 6ft tall! The next three minutes are a blur. I just remember the barrage of self-conscious thoughts: “I’m talking too quickly”, “I’m taking too long”, “I’m shouting”, “can they all hear me?”, “I hate my voice”, and the worst one: “why does this run brief contain so many damn Rs!” (for those who haven’t noticed, pronouncing Rs is not my strong point!). 3-2-1-parkrun and their off! A wave of relief as the runners disappear around the corner. The next 18 minutes are fairly relaxed. Everyone is in place for when the first finishers cross the line. I spend most of my time near the funnel, checking that the timekeepers and finish tokens are on track with each other. Then something happens. I still don’t know exactly what, but next check of timekeepers and finish tokens shows that they’re one out from one another. Oops... Don’t panic. Nothing I can do about it now. I’ll deal with it afterwards. A couple of further issues arise; two people cross the finish line twice. But the funnel managers and finish token volunteers are on the ball and spot this and remedy it quickly and easily. Both people are given a second finish token and we explain that they must scan the first and pop the second in the tub without having it scanned. Around 10:15 and the last people cross the finish line, followed by the tail walkers. We pack up the rest of the finish and head back to the bowls pavilion. Meanwhile, various volunteers have packed up the rest of the course. We pack everything back into the kit boxes and head to the café. Bev has already set the laptop up for me. Time to process the results. I plug in the first barcode scanner. Then I see the message on the screen. ‘No OPN records found’. I don’t know what that means, but it certainly doesn’t sound good! Did I accidentally press the reset button on the scanner? If so, that’s 1/3 of the runners who won’t get their results! Bev tells me not to panic (I still do) and I unplug it and try again. Same message. I try another barcode scanner. That one works fine and the results from that one are uploaded. I try scanner number 3. That works fine too. This worries me even more because it tells me it’s the scanner, not the cable or laptop. I plug scanner number 1 back in and wait... Bev then says “if this doesn’t work I don’t know what to do”. Whaaaat??? I need you to tell me that this is a common issue that you have a remedy for! We both wait, nervous energy floating between us. Then... 202 records uploaded. Yes! Not sure what the issue was and frankly I don’t care. It’s working. Phew! I plug in and upload the stopwatch data. I then manually enter those whose barcodes wouldn’t scan. I remove the second result of those who crossed the line twice. I manage to work out that the discrepancy between the timekeepers and finish tokens occurred between runners 96 and 148. But that’s a fairly wide window. Not entirely sure what to do about this, so I ask Roger to help out. We work out what to do to fix this, and the results are good to go. I then finalise the volunteer roster, adding in those who turned up in the day to support, to ensure they get their volunteer credit and thank you email. I then hand the kit over to Nicola, who is RD this week, and do a final Facebook post for the week. Finally, I can relax! Overall it’s gone pretty well. Everyone is alive, and got their results. The support from The Core Team and the runners/volunteers was great! In a weird way, despite the stress and anxiety, I’m quite looking forward to my next stint as RD! We're pleased to announce we will be organising a Christmas Day special parkrun! This will be in addition to our normal Saturday events, so please make a note in your diaries for Tuesday 25th December 2018 at the usual start time of 9:00 a.m..
A few volunteers are required for the event, but we will be operating a 'parkrun lite' event to keep the volunteers to a minimum. Please note the café in the park will not be open. We will not be organising a parkrun on New Year’s Day, but there are other parkruns announcing New Years Day special parkruns - look out for separate parkrun announcements. See you there! Ho ho ho! Winner: This was possibly the easist of all our awards to decide upon. Last year as part parkrun's PROVE project (Parkrun: Running Or Volunteering for Everyone), the idea of training some of our regular parkrunners as Visually Impaired guides arose. We were blown away by the interest and enthusiasm that we received. it so happened that on our 2nd week of trialing VI guiding, a young lady with a visual impairment arrived with her Mum for her first ever parkrun. Since then this lady has hardly missed a parkrun and run with us. 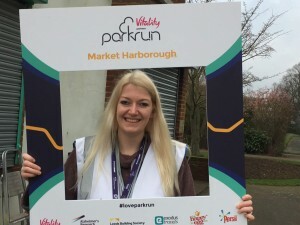 We've had 4 different VI runners visit Market Harborough as a result of this initiative and some of our guides have also ventured to guide at other parkruns. Wiki nominated them as did many others, your parkrun story of the year is: The VI guides - please thank all those who have guided so far: Simon Poynton, Graeme Rolfe, Jo Howell, (Roger Pangbourne), (Jo Raine), Clare Tector, Katie Carnell and James Butler. (Nicky Garratt) and Martin Hazlewood have also guided in training mode. 1) Welcome to Team Pangbourne and thanks to everyone else for attending. 2) "Pacing Pairs" trial will be extended. It was thought that pairs appear to be hitting times more consistently and that it's a good way to support runners that may not be as experienced. 5) A "Naked Run" (no watches) will be done for the nearest Saturday to when the clocks change in October. 6) A new recording system will be used to help address issues surrounding under 11's running alone. 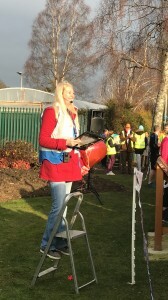 One of the Funnel Managers will record the finish position of any children running alone that they suspect are under 11. If it is confirmed afterwards that they are under 11, the time will be removed from the results. This includes children doing a sprint finish between the playground and finish line. 7) Sign support at briefing - Lisa Campbell has kindly offered her support. We will begin by trialling it at the First Timers and Main briefings. We will encourage other signers to come forward and investigate avenues to promote the service. 8) Milestones celebrations - It was agreed that the milestones that are officially recognised by parkrun t-shirts will remain the focus. We reserve the right to celebrate anything else that we like too! 9) Roster - Finish Token Support role will be replaced by a second Finish Token. This is to acknowledge the way that token distribution now operates. Token Sorter will be reinstated on the roster. One person can receive credit for this role. To encourage new faces to have a go, no one can do the role more than once in a 6 week period. First Timers Briefing role is now opened up to anyone, there will be a script provided. 10) Basic CPR refresher training to be investigated. 11) Handheld radios trial has proved to be a success. They are issued to RD, FM and marshals at Turnaround and Playground. From 0-100 in 2 years! 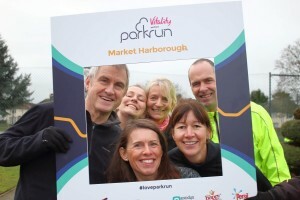 I took part in my first parkrun at Market Harborough on 9th May 2015, which was their run number 3. In February this year, I realised that I would be completing my 100th run later this year. I then set myself the arduous task of completing my 100th run on my birthday, 26th August. Looking at my diary, this deadline would only allow me to miss two runs, which would be when I was on holiday in August. Having already committed to do a 10k run in June, I soon realised that I would have to be a tail walker on this day otherwise I wouldn’t achieve my goal. The other motivation for me completing my 100th run on my Birthday, was that I was in the lead for the number of runs completed at Market Harborough – my closest competitors in April were between 4 and 6 runs behind my total runs. This would be the only time that I would be ‘first’ at a parkrun! So, on 26th August I ran my 100th Market Harborough parkrun, on their run number 124 – becoming the first person to complete their 100th parkrun exclusively at Market Harborough. The atmosphere was brilliant and I loved every moment of it. The whole morning was made even more special as my parents and husband came to watch and I ran with my brother-in-law who tried to pace me to a PB, but unfortunately we didn’t quite succeed. The amount of congratulations and birthday wishes I received on the course was overwhelming and I would like to thank everyone for their support. The other notable milestone this week was Paul Atkinson, who completed his 50th run. First across the finish line was Luke Montgomery (Corby AC) in 16:20; there were 70 runners with new PBs, and 33 First Timers. The total number of runners this week was 346. During the last two years, I have also tried out various volunteer roles too, and will certainly do more volunteering now that I have reached my 100. Over the last two years I have met so many people as a result of parkrun, and have found the courage to join a running club. I simply love the atmosphere and community spirit that parkrun is all about. parkrun is now part of my weekend routine. 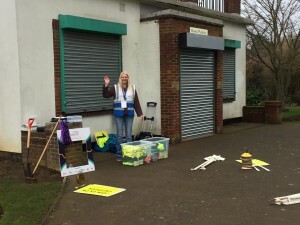 My plan now is to get back to regular volunteering, and I would recommend everyone gives this a go as it is really helpful to see parkrun from the other side. I may also try a bit of touristing in the future.